People stare, point fingers with shock and then make way with an unnatural urgency. I move ahead, the Harley parting the crowded roads like Moses' staff that split the Red Sea in half. With more lights than a carnival and a detachable windscreen that might keep even El Nino at bay, the Road King is an imposing sight. There's really no use compounding my fear of it's size with sheer panic as I'm about to road test the Harley. I close my eyes as I swing aboard the motorcycle. But the eyes are not shut in fervent prayer, just that the chrome is blinding in the afternoon sun and has everybody scrambling for their shades. Taking the Road King off the kick stand is not as much of an effort as I had imagined. Sure, it's well fed, and weighs in at a hefty 368 kg at the kerb. Seems like the thing was breast fed whey protein and flapper jacks since the day it began life as a large iron ingot. 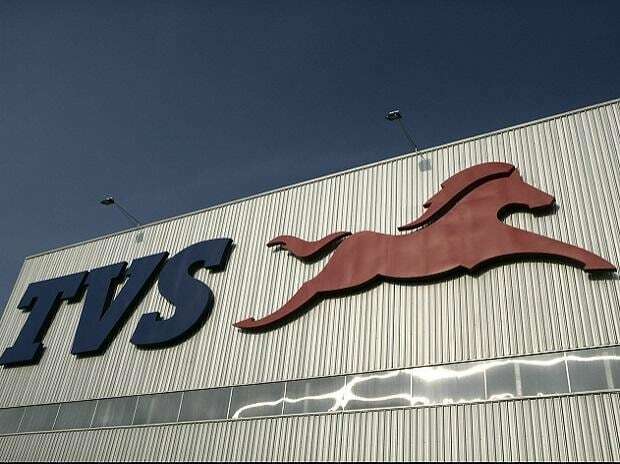 Once in the saddle, the view is commanding. So, this is what it feels to be king. I head out of Gurgaon towards Jaipur, away from the crazy drivers in Haryana towards the crazier sods in Rajasthan. 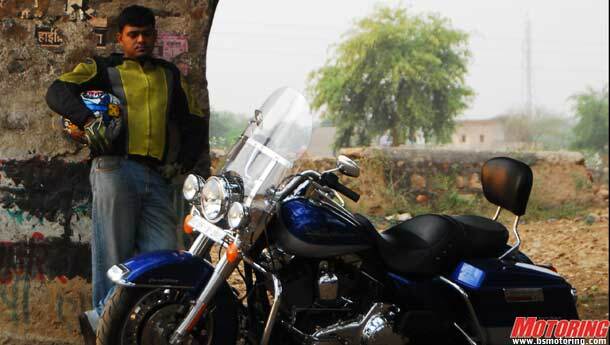 The roads get narrower and the Harley seems to get wider. With two typical Mumbai apartments dangling from either side of the bike, it takes some getting used to manoeuvring through tractor and human bovine traffic. Hot rodded dumper trucks, stripped of unnecessary bits like bonnets and common sense, barrel down the road, hell bent on sticking to the wrong lane. I smile as I welcome the Road King to the Russian Roulette we call the Indian roadways. Yes, there was the coming together of many cultures on this ride. The rumble from the 1584 cc V-twin is hardly audible at low revs but climbs as the engine spins up. Does it sound like a Harley? Well, yes it does, but it's a softspoken one. A pair of Screaming Eagle pipes, soon to be available as an optional extra, would have made the King a bit more vocal. 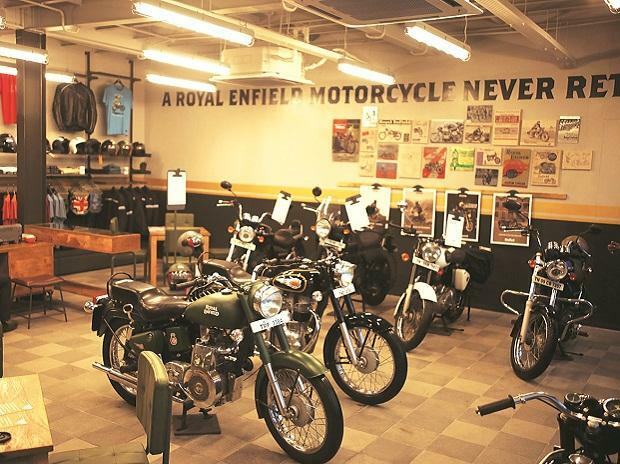 As I see it, owning a Harley is a complete experience that tingles each of the senses - a taste of freedom, touch of heritage, a pleasing sight of the long road ahead and the heart-warming sound of the 'potato-potato'. So, if you're ready to bring home a hog, I suggest you check out those free-flowing pipes first. Cruising is the Road King's forte, so much so that reading the road signs was the only giveaway that I was heading towards Shahpura and not Santa Monica. If the motorcycle's bulk was ever an issue, it was nothing when the bike was in motion. 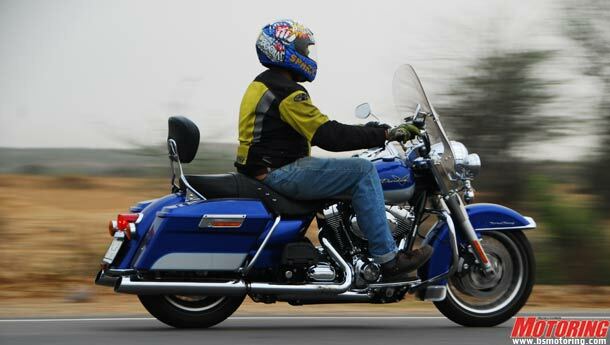 Plush over potholes and surprisingly limber on tarmac, along we went, the Road King wafting like a gentle zephyr on its air-adjustable rear suspension. ABS braking aids when that wafting has to stop at a moments notice and those four-pot calipers on the twin discs up front clamp down with vengeance. It's not quite in league of sports machines, but that is to be expected, especially with this much American pig iron prancing about. 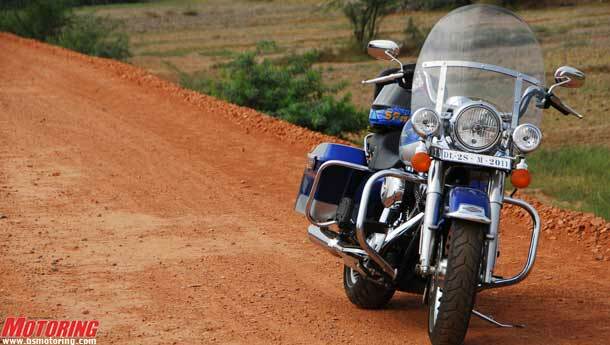 What's impressive about the Road King's motor is how relaxed and unruffled it is. Slot the gearbox in top (6th) and a mere feathering of the throttle will merit an easy 80-90 kph on the speedo. On too many occasions for it to be a coincidence, I caught myself wondering why the cars around me seemed to be struggling to keep up, only to catch a glimpse of the Harley's needle hovering at about 140 kph. Acceleration is appreciable, with a 0-60 sprint clocking in at 3.8 and a 0-100 kph time of 6.1 seconds. Not impressed? Well, you can't really rush royalty, now can you? 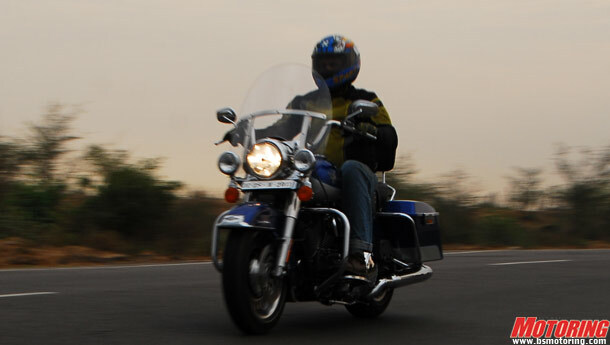 The roads didn't permit an all-out top-speed run, but from what I reckon, the Road King should be good for about 160 kph. 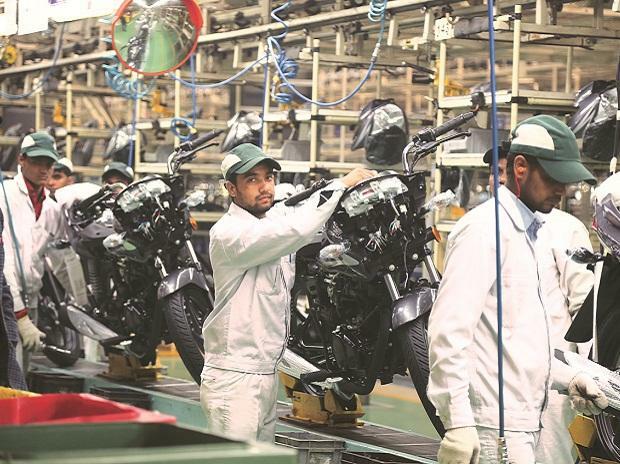 Harley-Davidson is tight-lipped about the power output of their bikes, but what they will shout out from the rooftops is the torque that their big twins produce. And by George, do they make a truckful. The FLHR Road King V-twin puts out nearly 13 kgm of MACK big-rig lugging power. All of that tug comes at a mere 3750 rpm, and so you could probably pull a dam along with the engine at just past tick-over. That also means the King will exercise its might over humble subjects with a mere blip of the throttle, in whichever gear and at nearly any speed. Overtaking will never again involve a downshift, an offering to the Gods, and then a nervous pass, especially when you're on the Harley. I've always been told that Harleys can't corner. But from the looks of things, these opinions seem to come from blokes who'd rather be opining than actually riding. For it's dimensions, the Road King nips around with astonishing alacrity. Okay, so it would be a big fat pig on a race track but hey, you'd be pig-headed (sorry, but I couldn't resist!) to pit it there in the first place. On the highway, however, there aren't too many motorcycles out there that can quite match the comfort that the Road King provides the bloke in the saddle, nay, the throne with. The rider's seat is as expansive as the Steppes, while the pillion gets a little sofa, complete with a well-padded backrest and floorboards to boot. Your composure quickly disappears the instant you are forced to make a tight U-turn. All of that weight of the FLHR abruptly reappears the second you drop speed to about 5 kph and below. Come to a stop, look out for oncoming traffic and quickly rumble away - all the time wishing your foot was made of titanium alloy and not flesh and bone. The self-centring triple tree (designed by a certain genius named Eric Buell) helps to a large extent, but it's what you had for breakfast that makes or breaks the whole manoeuvre. 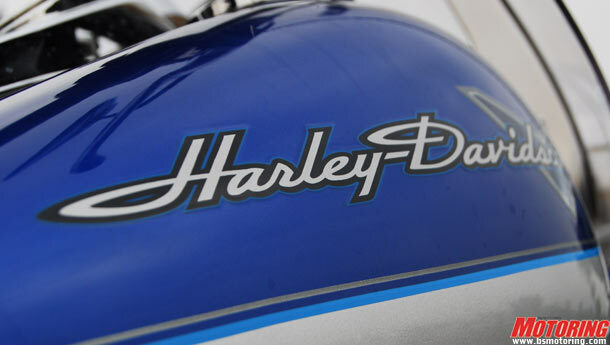 Harleys the world over don't come cheap. But ironically, we as a developing nation are forced to shell out nearly double of what everybody elsewhere would need to. Tagged at Rs 20.45 lakh, ex-showroom, Delhi for a bone-stock bike, you might want to add on the pipes or maybe even some extra bling; not that it needs any more in my opinion. All of that adds up to quite a substantial amount of money, but hey, you get more than just the bike. Your money buys you a whole new lifestyle and membership into a very unique clique. What's more? You can actually be something you always wanted to be - the real king of the road.